To help you along the way we have rounded up some of our top tips for mastering two wheels. 1. Always start with a balance bike. Balance bikes have no pedals or stabilisers and are much lighter than pedal bikes. On balance bikes, children use their feet to balance and propel themselves along. One of the biggest advantages of this method is that children as young as two learn to balance on their own without explanation, coaching or unnecessary stress. 2. Start on the flat and work your way up. The ideal place to ride a balance bike is a park or area with no traffic. Begin on flat terrain and gradually upgrade to small hills. Around the age of two and a half to three years, children are able to operate a hand brake provided it is gentle enough for their little fingers. Show your child how it works and motivate him/her to practice braking. A good tip is to draw a line on the pavement and challenge the child to stop on it. Wearing a helmet on a balance bike – as on any other bike – is another must. The sooner your child gets used to it, the better. 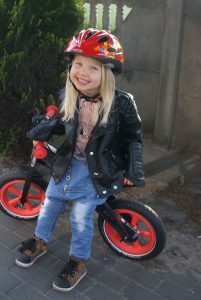 Shop for a helmet together, and let the little biker express his or her opinion. Make it a treat! 5. Look for safety features like a ‘steering limiter’. Bikes like FirstBIKE with handlebars that limit the steering angle, a “steering limiter,” help little ones keep direction and prevent falls. Models with sharp edges or extruding screws should also be avoided. 6. Choose a bike with an adjustable seat. On balance bikes, children immediately benefit from the security of having their feet on the ground, so it is important that the seat is easily adjustable to their height. When the child sits on the bike, both feet should be firmly planted on the ground – not just the toes – with knees slightly bent. This way, the child is able to properly push off, slow down and stabilise. 7. Get the right safety gear. Wearing bright colours or a safety vest is recommended, ideally with reflective elements so he or she is readily visible. As for shoes, balance bikes are called “run bikes” in many languages, which means that flip-flops will not do – toes should be covered and ankles fixed. 8. Transfer to a pedal bike when the time is right. Around the age of four or five depending on their height and skill – children can smoothly transfer to a pedal bike without ever needing stabilisers. From a balance bike, such as FirstBIKE, children learn how to balance and use a hand brake. 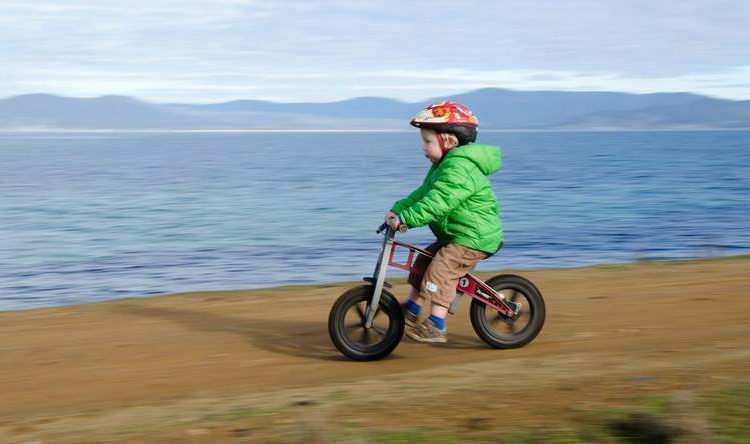 The only skill they still need to learn is pedalling, however, at the age of four or five, it is a natural transition. FirstBIKE is an international balance bike company producing bikes for children between 2 and 5 years. FirstBIKE’s mission is to distribute the safest, highest quality and most well designed balance bikes on the market. Additionally, FirstBIKE seeks to educate the general public about the many benefits of balance bikes and their significant advantages over traditional pedal bikes with training wheels. Every FirstBIKE proudly comes with a lifetime warranty on the frame and fork and a 5-year warranty on all other parts. For more information please visit www.first-bike.co.uk.